My latest 15 min radio broadcast in the Ockham’s Razor series begins with the story of why Einstein decided not to wear socks (see Mini Story #7), but goes on to encompass how we can make the best decisions in our complex world and how Governments and big business are using automated decision making processes to make decisions vital to our future, and what we can do about it. I have to say that I am rather pleased with how it came out. I’d like to talk to you today about Einstein’s socks – well, not so much about his socks, but about the way of thinking that led him to decide never to wear them, and which also led him to his theories of relativity. The clue to Einstein’s thinking here lies in that little word “so.” “SO I stopped wearing socks” involves a logical leap. 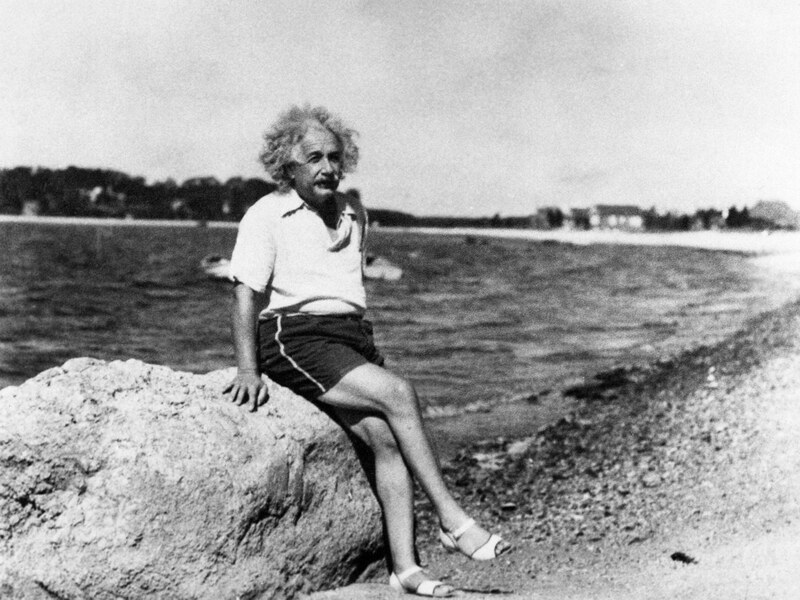 OK, when we look at photographs of Einstein in sandals, we can see that his big toe projects well beyond the second. But why should this mean that he had to give up the comfort of socks? Why not just buy new ones when the old ones wore out? What surely swung Einstein’s decision was the underlying thought “what if?” “What if I gave up wearing socks?” is not a question that would occur to many of us, but to Einstein it was a natural question to ask. He decided that they weren’t worth the bother, and from there on led a basically barefoot existence. When Einstein was 15 or 16 wrote a letter to his uncle, Cäsar Koch, in which he asked another “what if?” question – what would a light beam look like if you could run alongside it at the same speed? Probably he didn’t realize it at the time, but he was asking a fundamental question that had been bugging physicists for some time. The problem was this. A light beam was known to be an oscillating wave travelling through space, rather similar to a water wave travelling across an expanse of water. I’ve driven alongside a water wave travelling up a river, and it appeared to my eyes to have a constant, immobile shape as I looked across at it. You would think that a light wave would also appear to have a constant, immobile shape if you could keep pace with it. Yet physicists knew that Maxwell’s equations, which describe the propagation of light waves, forbid the occurrence of such a stationary state. Ten years after he first raised the question, Einstein came up with an answer in the form of another “what if?” question. What if you couldn’t ever run alongside a light wave? What if, no matter how fast you ran, the light wave always caught up with you and passed you at the same speed as if you weren’t running at all? Then it would simply be zipping past, no matter how fast you were travelling, and would never appear stationary. In exploring this possibility, which sounds as though it comes from a world of cartoon fantasy, Einstein came up with his Special Theory of Relativity. In fact, the world of cartoon fantasy is littered with “what if” scenarios. They’ve been encapsulated in the laws of cartoon physics, such as the law that characters are never affected by the law of gravity until they notice it – after they’ve stepped off the edge of a cliff, for example, and remained suspended until they have suddenly realized their perilous situation and gone plummeting to the round. The world of cartoon fantasy doesn’t concur with our observations of reality, but many of the major advances in science have come through checking out the answers to “what if” questions. One of the best known was due to Isaac Newton, who wondered what would happen if all bodies, no matter how far apart, exerted an attractive force on each other that diminished with the square of the distance between them. Newton checked out his speculation by calculating what the orbits of the Moon and planets might be if such an attractive force did exist, and of course he got answers that conformed with reality and supported his idea about the force that we now know as gravity. More recently, a world-wide team of scientists has confirmed the existence of waves in the gravitational field – a prediction that was made by Einstein when he asked “what if” gravity was a geometric property of space and time. But “what if” questions are going a lot further these days, and impinging on our lives in ways that more people should know about. Probably the simplest to grasp conceptually is the idea of scenario planning. In developing policies for flood or fire protection, for example, a responsible body might ask “what if” so may houses are built in an area, or “what if” rainfalls reach a particular level that might produce flooding. Similarly when it comes to protection against terrorist attacks a series of “what if” questions is likely to be high on the agenda. In all cases, a set of possible scenarios is drawn up, the likelihood of their occurrence analyzed, and appropriate measures put in place. Or so the theory goes. One of the great problems with this sort of approach is the common assumption that the future is likely to be the same as the past. When the first attempts at systematic weather forecasting were made, one idea was to look back through the records for a day where the weather was much the same as the day when the forecast was being made. The assumption was that the weather on the following day would be the same as the weather on the following day in the historical past. Some of the greatest investment in this area has come in the form of climate modeling, which has been the subject of other ABC science programmes. But the biggest insights, the ones that policy-makers really need to sit up and take notice of, have barely reached the fringes of public consciousness. The first, and most important, is that all complex systems have a built-in capacity to change suddenly to a different state. By complex systems I mean systems of many interacting parts, where the emergent properties of the whole can be much greater than the sum of its parts. So banking systems may collapse almost without warning; societies may burst into rebellion; the composition of the bacterial ecosystem in your gut or the wider ecosystem of which you are a part may suddenly change. No amount of forward planning can prevent such changes in the long term. Such planning is too often based on the political assumption that some particular set of dogmas ought to work, therefore it must be possible to make them work. But instead of aiming to set our complex socio-economic-ecological world in concrete in this way, we should instead be aiming for resilience – the ability either to bounce back from sudden change or to accept and adapt to it, if that seems the better option. This is where the frequently-bandied idea of big data comes into the frame, usually with the idea that, if we only know enough about the system, we will be able to control how it behaves. Fat chance. One of the strongest insights from our era of big data and computer modeling is that tiny changes in one part of the system can give rise to dramatic change in other parts. So our modern “what if?” question becomes “when?” Not what will happen if there is a sudden change in our apparently well-regulated and stable world, but when such a change inevitably happens, will we be prepared? At the moment we are not, for the simple reason that the pace of change when it happens is too rapid for human institutions to cope with. It is for this reason that share markets, not to mention institutions like Google, Facebook and Twitter, now rely on algorithms to make decisions for them. An algorithm is a set of pre-decided rules that take data like share prices, incomes or our personal habits and use them to develop actions and policies, from choosing which advertisements to target us with, to where to put the money that we have saved for our retirement. Governments are now using algorithms as a convenient way to develop social policy, and an algorithm has even been appointed as a board member of a Chinese investment company, with full voting rights! The problem with algorithms is that neither we nor the developers of the algorithms can see what is going on beneath the surface when an algorithm is implemented, yet we can be deeply affected by the result. Cold-blooded algorithms can produce hot-blooded outcomes, as when military drones are directed by algorithms both to seek out targets and to take whatever their owners conceive to be “appropriate” action against them. With the advent of algorithmic governance in many areas we have come to an era where “what if?” has been replaced by “what”. An algorithm is told what the data are, and proceeds from there unquestioningly. But what if different variables might produce a different outcome? What if, for example, we could input human values and aspirations, rather than incomes, ages and social status, into the algorithms that are coming to control our lives? Ah, well – I may not be an Einstein, but at least I can dream.